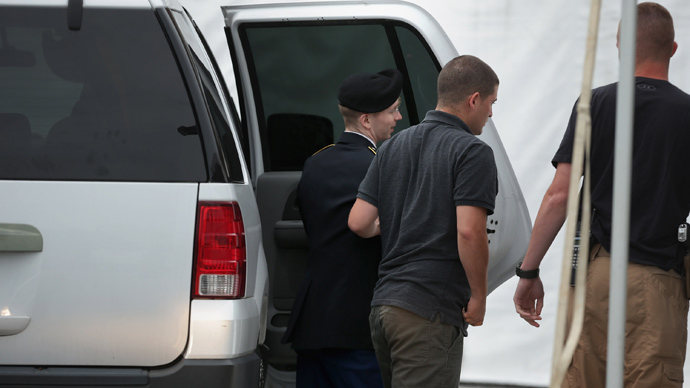 A US military judge has found Army private Bradley Manning "not guilty" of aiding the enemy. However, he was found guilty of 20 remaining charges, meaning that he still faces the possibility of up to 136 years behind bars. Sitting in the military courtroom at Fort Meade, Md., Colonel Denise Lind delivered her verdict shortly after 1 p.m. EDT on Tuesday. 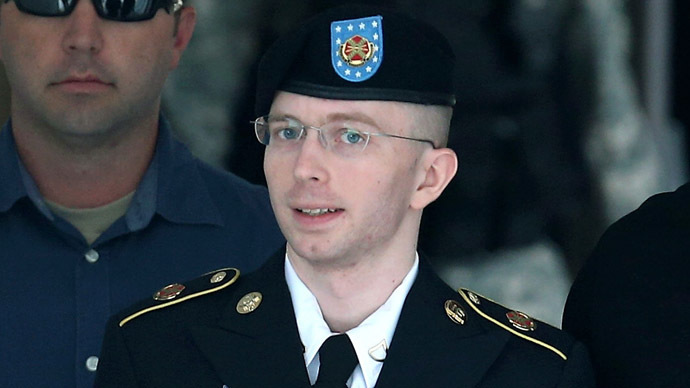 Manning had chosen to put all his faith in the judge, rather than a panel of his peers – a risky gamble that initially seemed to pay off for the 25-year-old Army intelligence analyst – the charge could have carried a life sentence without parole. However, Manning still faces the possibility of up to 136 years behind bars, having been found guilty of six charges of espionage, five counts of theft, and four counts of embezzlement of government property. In total, Judge Lind found him guilty of 20 of the 22 offenses he could have been charged with. 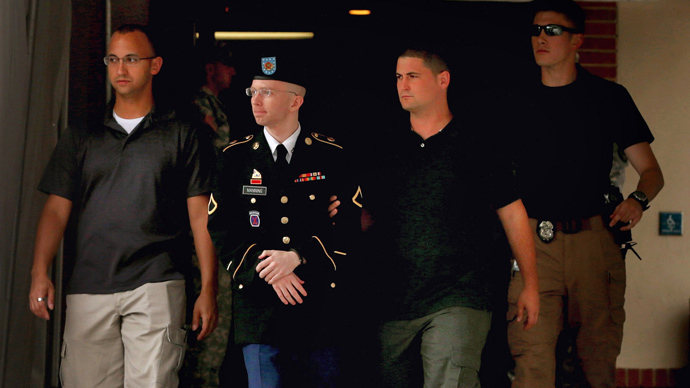 Manning was found not guilty of espionage for the release of the infamous "Collateral Murder" video. Guilty of almost everything BUT aiding the enemy. Manning's family issued a statement saying that while they are "obviously disappointed in today’s verdicts, we are happy that Judge Lind agreed with us that Brad never intended to help America’s enemies in any way." Wikileaks expressed a similar sentiment but still aired disappointment at Manning's future possibilities. Sentencing begins on Wednesday at 9:30am. Some 40 witnesses will be called for this stage of the process, meaning it could potentially take the whole of August to finalize his penalty. The extent of the punishment he could still face has roused upset from human rights and justice organizations. "The US government has refused to investigate credible allegations of torture and other crimes under international law despite overwhelming evidence...yet they decided to prosecute Manning who it seems was trying to do the right thing – reveal credible evidence of unlawful behavior by the government," said Amnesty International's Senior Director of International Law and Policy, Widney Brown, in a statement shortly after the verdict was read. “The Espionage Act itself is a discredited relic of the WWI era, created as a tool to suppress political dissent and antiwar activism, and it is outrageous that the government chose to invoke it in the first place against Manning,” said the Center for Constitutional Rights in a statement. “We now live in a country where someone who exposes war crimes can be sentenced to life even if not found guilty of aiding the enemy, while those responsible for the war crimes remain free,” it admonished. Index on Censorship also jumped to condemn the guilty verdicts, saying that Manning "leaked files in order to inform the world about what really happened during the Iraq War to no personal gain." Sean Gallagher, its editor, urged the court to "show leniency" when sentencing Manning tomorrow. 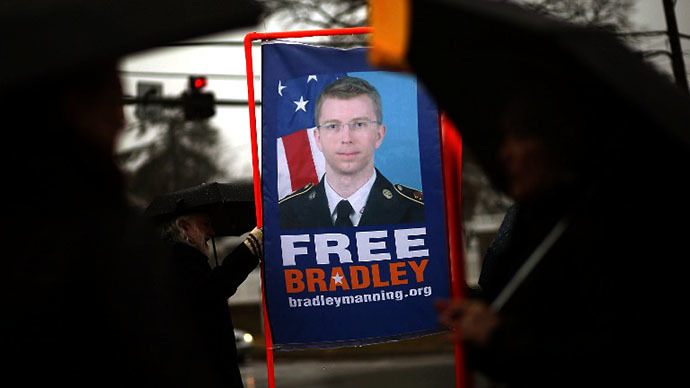 Protesters rallying in support of the whistleblower gathered outside the Military Recruiting Office on Tuesday, holding signs and posters that described Manning as a hero. 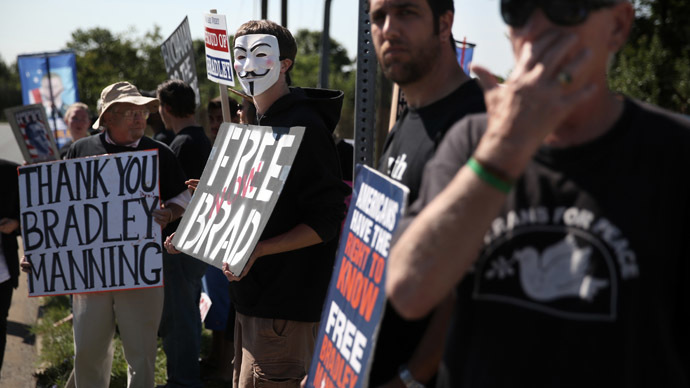 Chanting “Free Bradley Manning” and “Three Years is Enough,” the activists stood outside the Fort Meade courtroom in the hours leading up to the verdict. In the days leading up to the verdict, celebrities, public thinkers and European Parliamentarians all voiced support for Manning and urged the president to free him. Over the weekend, protesters in 40 cities throughout the worldtook partin an “International Day of Action” to call for Manning’s liberation. “Exposing war crimes is not a crime,” and “Bradley Manning: hero not criminal,” were some of the bold statements displayed on the signs. Wearing “truth” t-shirts and waving signs, the group of loyal "truth-activists" proclaimed their respect for the young Army intelligence analyst, and celebrated Col. Lind’s decision. During the eight-week trial, government prosecutors argued that Manning indirectly aided al-Qaeda by sharing thousands of classified documents with the anti-secrecy website WikiLeaks in late 2009 and early 2010. The terrorist organization downloaded the information, and Maj. Ashden Fein told the judge that Manning expected the material would be seen by al-Qaeda. The prosecution depicted Manning as an ill-intentioned traitor who sought fame and notoriety. “I believe that if the general public… had access to the information… this could spark a domestic debate as to the role of the military and foreign policy in general,” Manning said in March, speaking from a 35-page prepared statement for the court. Although Col. Lind found Manning not guilty of aiding the enemy, the 25-year-old native of Crescent, Okla., faces 21 counts, including espionage, computer fraud and theft charges. He could still receive time in military jail. In March, Manning admitted to sending classified material to WikiLeaks, including 470,000 Iraq and Afghanistan battlefield reports and 250,000 State Department diplomatic cables and material. He pled guilty to 10 lesser charges, which could still lead to a maximum sentence of 20 years imprisonment. The verdict was a landmark decision that could predict how US authorities handle individuals disclosing state secrets. WikiLeaks founder Julian Assange on Friday expressed his fear that if Manning were convicted of aiding the enemy, it would be “the end of national security journalism in the United States.” The progression of the high-profile case may still instil fear into potential whistleblowers, especially in combination with the United States’ handling of former NSA contractor, Edward Snowden. 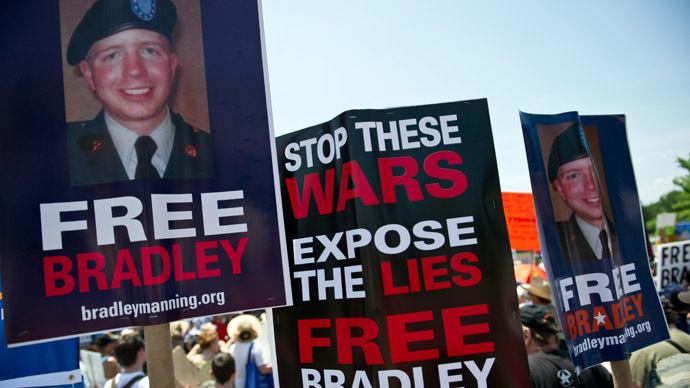 But for now, Col. Lind’s “not guilty” verdict of aiding the enemy has served as a cause for hope and celebration among truth-advocates and supporters of Bradley Manning’s efforts to expose the war crimes and wrongdoings of the US government.